The town of Woorabinda is located in central Queensland, 170km south-west of Rockhampton and 65km south of Duaringa. According to the anthropologist Norman Tindale, Woorabinda is situated on the traditional lands of the Wadja Wadja/Wadjigal Aboriginal people, who lived on the country between the Expedition Ranges and Dawson River before the arrival of Europeans. The German explorer Ludwig Leichhardt travelled through the Dawson Valley and Expedition Ranges area of central Queensland in late 1844 during his expedition from Jimbour to Port Essington. Following Leichhardt’s expedition, European pastoralists began to settle in central Queensland from the late 1840s, which led to widespread frontier violence as Aboriginal people resisted the invasion of their lands. In the Wide Bay and Burnett districts, between 1847 and 1853, 28 squatters and shepherds were killed, and reprisal killings by the squatters were the usual response. The use of mounted Native Police was instrumental in crushing Aboriginal resistance. Native Police would often accompany settlers as they travelled overland to take up pastoral runs in central Queensland. A detachment of Native Police had been stationed at Gayndah in November 1850. In response to the movement of the frontier to the north and west, a Native Police barracks was established at Rockhampton in 1860, and at the Nogoa River between Blackwater and Emerald in 1861. On 17 October 1861, 19 men, women and children were killed by a local Aboriginal group at Cullin-la-ringo Station on Garden Creek, near Springsure. A reprisal expedition was organised consisting of townspeople from Maryborough and Rockhampton, reinforced with detachments of Native Police. Historical records indicate that this resulted in many deaths for Aboriginal people. The retaliatory action and a continued Native Police presence in the district, eventually broke the Aboriginal resistance to the settlement of central Queensland. The survivors of Native Police operations were used as cheap labour on pastoral stations or gravitated to the fringes of settlements to eke out an existence there. In 1897, the Queensland Parliament passed the Aboriginal Protection and Restriction of the Sale of Opium Act. Under s 9 of the 1897 Act, the ‘Protector of Aborigines’ was granted the power ‘to cause Aboriginals within any district to be removed to and kept within the limits of any reserve situated in the same or any other district’. Woorabinda was one of those places to which Aboriginal people could be removed. Woorabinda was established between 1926 and 1927 by the Queensland Government as a replacement for the Taroom Aboriginal reserve, which was located on the banks of the Dawson River. Taroom reserve was closed down in 1926, after 16 years in operation, as it was situated in the path of a proposed irrigation dam. The government selected 55,000 acres in the Duaringa district, which became the new Aboriginal reserve of Woorabinda. Aboriginal laborers from Taroom began clearing and fencing the land for the new reserve in September 1926. The new reserve was formally gazetted by the government on 29 October 1927. The residents of Taroom were transported to Woorabinda on flatbed trucks driven by private tenderers and, by December 1927, most of the 239 residents of Taroom had been removed to Woorabinda. The first superintendent of Woorabinda was H.C. Colledge. The settlement at Woorabinda was divided into 2 sections, the officials’ area which included the boys and girls dormitories, and a separate area for Aboriginal families. According to a government annual report dating from 1927, the Woorabinda settlement was ‘laid out on town planning lines, with an attractive tree-planting scheme’. However, the new reserve was underfinanced and under-resourced, with little money for buildings, beds and sanitation facilities. The dormitory children slept on the ground in a bark and iron shed without mattresses, through 3 icy winters. Woorabinda residents sat on the ground and ate food with their hands because the reserve had no furniture or cutlery. In the first months of 1928, the local waterholes dried up and the reserve was hit by a fatal outbreak of influenza. Facilities were gradually established at Woorabinda and, in 1930, the first school was constructed followed by a hospital in 1932. Anglican and Roman Catholic churches were also opened in 1928 and 1933. Drought hampered efforts to farm crops at Woorabinda during the 1930s, and a number of dams were constructed to improve the water supply. Outbreaks of disease were a common occurrence, with the death rate exceeding the birth rate at the settlement throughout the 1930s. The population of Woorabinda grew substantially during this period, increasing from 298 in 1927 to 843 in 1943. The rapid population increase was the result of the government’s removal of large numbers of Aboriginal people to Woorabinda. Between 1927 and 1943, there were 575 documented removals of Aboriginal people to Woorabinda. In November 1938, the anthropologist Norman Tindale visited Woorabinda and recorded the family histories of many of the Aboriginal residents. Tindale’s genealogies reveal that, in 1938, the residents of Woorabinda represented 47 different tribal groups including groups from New South Wales and the Northern Territory. Woorabinda was re-gazetted as an Aboriginal reserve on 20 September 1941. During World War Two, the military authorities ordered the disbandment of the Lutheran Aboriginal Mission at Cape Bedford near Cooktown. The German superintendent of the Mission, Reverend Schwarz, was interned. In May 1942, the decision was made to remove the 271 Aboriginal residents of Cape Bedford mission south to Woorabinda. The forced relocation was a disaster. Woorabinda did not have the facilities to adequately house the large group of new arrivals. Arriving at the reserve in winter, the Cape Bedford people lacked warm clothing and were only issued with a single blanket per person. Within 6 months of their arrival, 39 Cape Bedford people had died at Woorabinda, 30 of them children. Hookworm was rife in the community, and outbreaks of gastroenteritis, mumps, influenza and pneumonia contributed to the deaths of many of the Cape Bedford children. During the war years, many Aboriginal men from Woorabinda worked as agricultural labourers on farms and properties across Queensland. Cape Bedford men who were working at Foleyvale Station (which became part of the Woorabinda Reserve in 1946) went on strike in 1944, in protest over their poor living conditions and insufficient food rations. After the war, the Lutheran missionary, Reverend Schwarz, returned to far north Queensland and purchased land for a new mission settlement, which was named Hope Vale. The Cape Bedford residents of Woorabinda received permission from the government to leave Woorabinda and returned to Hope Vale in 1949. After the war, large numbers of Aboriginal people continued to be removed to Woorabinda, including approximately 630 documented removals between 1944 and 1970. The last official removal to Woorabinda was an Aboriginal family taken to the reserve from Camooweal. In 1948, approximately 5 acres of land were gazetted as a reserve for the benefit of Aboriginal people at Duaringa, and the area situated between Foleyvale station and Woorabinda was gazetted to accommodate Aboriginal people moving between the 2 locations. In 1956, a separate school for the children of settlement officials was opened. Prior to this, the children of officials attended the same school as the Aboriginal children of Woorabinda. By 1956, all community houses at Woorabinda were receiving electricity and a new water tank with a filtration system had been erected. Despite this new facility, the provision of clean, fresh water to the residents of Woorabinda remained problematic up until the 1980s. In June 1959, Foleyvale station was declared a separate reserve from Woorabinda. Produce grown at Foleyvale included cotton, wheat, grain sorghum and peanuts. Cattle and pigs were also raised at the station. Some of the produce from Foleyvale went to the residents of Woorabinda, with the rest sold commercially. Outbreaks of disease and poor dietary and sanitary conditions continued throughout the 1950s at Woorabinda, and in 1960, an outbreak of gastroenteritis at Woorabinda caused the deaths of 8 people. On 30 March 1985, the Woorabinda community elected 5 councillors to constitute an autonomous Woorabinda Aboriginal Council established under the Community Services (Aborigines) Act 1984. The Act conferred local government type powers and responsibilities upon Aboriginal councils for the first time. The council area, previously an Aboriginal reserve held by the Queensland Government, was transferred on 28 October 1986 to the trusteeship of the council under a Deed of Grant in Trust (DOGIT). On 28 March 1987, the Community Development and Employment Program (CDEP) was introduced to Woorabinda. In 1988, construction began on 22 new houses in a program designed by the council. Other new developments included a swimming pool and sporting facilities, a community hall and an aged care facility. On 1 January 2005, under the Local Government (Community Government Areas) Act 2004 (CGA), Woorabinda Aboriginal Council became the Woorabinda Aboriginal Shire Council. N Tindale, Aboriginal Tribes of Australia, (Australian National University Press, Canberra: 1974)186. Whilst historical records support the assertion that the Wadja Wadja/Wadjigal people are the Traditional Owners for this area, the Federal Court has not yet made a Native Title determination. L Leichhardt, Journal of an Overland Expedition in Australia, from Moreton Bay to Port Essington (Doubleday, Sydney: 1980). L McDonald, Rockhampton A History of City and District, 183-196; J.T.S. Bird, The Early History of Rockhampton,196-205; T. Forde, Confinement and Control: A History of Woorabinda Aboriginal Community 1927-1990, Bachelor of Arts, Honours Thesis, University of Queensland:1990,12-14. Donald Dignan, The Story of Kolan, (W.R. Smith and Paterson, Fortitude Valley: 1964).10-11. John Murray of Walooga Station, Wide Bay, ‘Letter to the Editor’, The Sydney Morning Herald, 3 February 1851, 2. J. Grant Pattison, ‘Battler’s’ Tales of Early Rockhampton, p.51; COL/A22, 61/2790, Colonial Secretary’s inwards correspondence, report from Lieutenant Patrick re killings at the Blackland Tablelands. The Sydney Morning Herald, ‘The Nogoa Tragedy: Slaughter of Upwards of Sixty of the Supposed Murderers’, 10 December 1861, 5. M Copland, J. Richards, A Walker, One Hour More Daylight: A Historical Overview of Dispossession in Southern and South West Queensland (Catholic Social Justice Commission, Toowoomba: 2006)127. Christopher Anderson, ‘Queensland Aboriginal Peoples Today’:1986, 303. T Forde, Confinement and Control,16-22 ; S. L’Oste-Brown & L Godwin, Living Under the Act- Taroom Aboriginal Reserve 1911-1927, Cultural Heritage Monograph Series, Vol.1, Qld Department of Environment and Heritage, Brisbane, 1995, p.79-84 ; Annual Report of the Aboriginal Department,1926, p.6, 8; J C Clements (ed.) Woorabinda 1927-1977 Golden Jubilee Year, Woorabinda Golden Jubilee Committee, 1977, p.5. Qld Government Gazette, Vol. CXXIX, No.107, 1454. Queensland, Annual Report of the Aboriginal Department, 1927. R Kidd, The Way We Civilise (University of Queensland Press, St. Lucia, 1997)95; Annual Report of the Aboriginal Department 1929, 6. Annual Report of the Aboriginal Department, 1930, 12; T Forde, Confinement and Control,33. T. Forde, Confinement and Control, 22; J.C. Clements (ed.) Woorabinda 1927-1977, 22-23. Annual Report of the Aboriginal Department, 1931, 12 ; Annual Report of the Aboriginal Department, 1935, 22-23; Annual Report of the Aboriginal Department, 1937, 18; Annual Report of the Director of Native Affairs, 1939,16; J C Clements (ed.) Woorabinda 1927-1977, 14. Community and Personal Histories Removals Database. Queensland Government Gazette, Vol. CLVII, No. 61, 1076. R Kidd, The Way We Civilise, 162-164; T Forde, Confinement and Control, 41-44 ; H Pohlner, Gangurru, Hope Vale Mission Board, 1986, 112-118. T Forde, Confinement and Control, 51-53; J C Clements (ed.) Woorabinda 1927-1977, 15; H Pohlner, Gangurru, 119-120. H Pohlner, Gangurru, 124-127; T Forde, Confinement and Control, 74; J C Clements (ed.) Woorabinda 1927-1977, 20. A/58662 Health & Home Affairs Batch Files, 48/6990 Native Affairs. Annual Report of the Director of Native Affairs 1956, 18; T Forde, Confinement and Control, 66-67. Annual Report of the Director of Native Affairs 1956, 16-17; T Forde, Confinement and Control, 67, 71, 104-105. Annual Report of the Director of Native Affairs, 1959 30-31; Annual Report of the Director of Native Affairs, 1960, 24-26; J.C. Clements (ed.) Woorabinda 1927-1977, 15-16. T Forde, Confinement and Control, 67-70; Annual Report of the Director of Native Affairs 1956, 15; Annual Report of the Director of Native Affairs 1957, 22. T Forde, Confinement and Control, 73; R Kidd, The Way We Civilise, 256; Annual Report of the Director of Native Affairs 1960, 23. 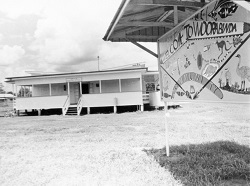 The administration office at Woorabinda, March 1976.